The first few days of our Math 20 class are for reviewing foundational topics about arithmetic and fractions. As always, this is merely a "best of their kind" collection of problems. If your math background is strong you might feel there are too many. If your math background is rusty or weak you might need to do additional problems from the textbook to get enough review and practice. Try to work these problems without using a calculator. Calculators will not be allowed on the midterm that covers these review topics. Use the floating buttons in the bottom right corner of the screen to show or hide the answers. Before you look at the answers you should have tried to work the problems "forwards". Do not examine the answers first and then try to work "backwards". For these foundational review topics it is better to wait and ask questions during class. When you have done enough review, try the arithmetic homework. The arithmetic and fraction review topics are explained in the first four chapters of our textbook. However, our review days do not have lecture or homework straight from the textbook. The first four textbook chapters are a valuable "unofficial" resource. Its chapters contain another way to explain each topic. Its example problems can help when practicing on homework problems. But the textbook is not required until we start chapter five. This policy allows students who recently used the textbook for Math 10 to see the material in a different way, without repeating the same textbook homework problems. It also postpones any potential issues from a student having the wrong textbook or the bookstore running out of textbooks. Most of the problems below have the corresponding textbook section(s) provided in this font: §1.5. The more deeply we understand division, the more deeply we can understand fraction and ratios. The online notes for this topic are here. 3. Draw a picture to show dealing 52 cards into four equal piles. (How many cards are in each pile?) Be able to explain how your picture represents division. 5. Draw another picture to show dealing 52 cards into piles of four cards. (How many piles do you draw?) Be able to explain how your picture represents division. Practicing our mental math helps us think about factors quickly. (a) What is his best move? (Hint: Odette does not get to claim any spots in reply.) If he picks 15 then Odette cannot reply and he comes out ahead by 15 points. (b) What will Odette's best move be on her turn? (Hint: Xavier can reply, but she still comes out ahead by 14 points.) She picks 28 and Xavier replies with 14. (c) Conidering the 7 spot is already taken, why shouldn't Odette claim the 14 spot as a simpler way to come out ahead by 14 points? The next turn Xavier would be able to pick 28 and she would be unable to reply. Place value names are needed to discuss rounding. They are also used when changing decimals into fractions. The rules for rounding are used when writing the answers to most word problems. 3. 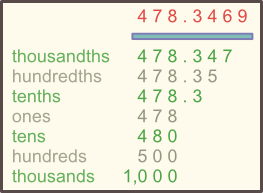 Find the rounding error below, where someone tried to round 478.3469 to different place values. 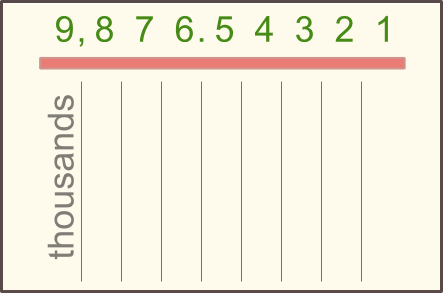 §1.6, §4.1 The hundreds digit is less than five, so when rounding to the nearest thousand we get 0 (not 1,000). Estimating is helpful for getting a rough sense of the size of a reasonable answer, which can help noticing a calculator mistake. 1. Estimate the sum or difference. Round all numbers (you pick how much to round) before mentally adding or subtracting. §1.6, §4.6 Answers will be different if the amount rounded is different. The acronym PEMDAS can help with order of operaton problems. Make sure you understand it correctly. Breaking up a long expression into terms is the most powerful way to deal with order of operations. 1. Find the number of terms in each expression. Knowing all the simple divisibility rules allows us to find important factors quickly. 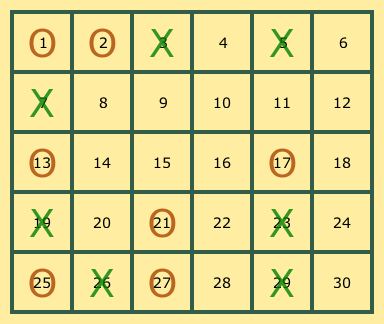 Notice that finding all the factors of a number and finding the prime factorization of that number are a very different tasks, using very different techniques. Isolate the variable by doing the same thing to both sides of the equation. For most of Math 20 the only equations to solve by isolating a variable are made by cross-multiplying. One side of the equation has the format "y times a number" so we divide both sides by that number to isolate y. For these problems you may use a calculator.